Our great range is made fresh and sourced locally, including our famous coffee. Try our freshly baked focaccia, rolls and pastries. 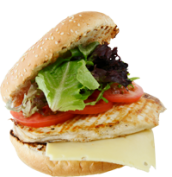 Enjoy the fresh to made gourmet burgers and be stunned at the quality and range in our famous big breakfasts. From frappes to fresh juices you have plenty of reasons to enjoy Cafe Maison. We focus on the best freshly available ingredients, from croissants to burgers, pastas and homemade dishes our customers delight in our daily offerings. As part of the Prime Group of restaurants you can be assured that you will have an enjoyable experience. By joining our loyalty club you can save up to 10%, this offer extends to our Asian themed DancinWok and Sushimaster restaurants. Find out more on our Prime Rewards page. When you visit our Café Maison locations enjoy our locally roasted and freshly ground coffee with affordable healthy fresh food.